With the new CHTK tester for overload cutoff, NOSHOK and tecsis offer a precise, robust and dependable tester for slip couplings on chain hoists. The CHTK has a large range of measurement, with high accuracy, low weight and ease of use. 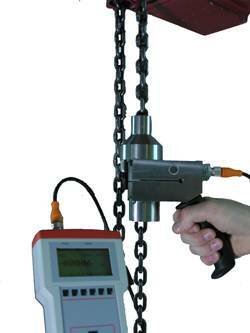 To perform the test, the force transducer is inserted into the chain, travels upwards with it against the base of the chain hoist and thereby blocks the chain. The display unit allows you to read off the magnitude of the force at which the friction clutch operates. The CHTK consists of a force transducer with integrated handle and a display unit. Included in the delivery are also two chain adapters and three centering sleeves to ensure the CHTK can be used for any type of chain hoist in the specified load range. The battery-driven indicating device evaluates the signals returned by the force transducer via a cable. The large illuminated graphical display makes it very easy for the user to read off the measured values. Optionally 99 different data sets can be stored and transferred via an infrared interface to the PC. One special feature is the single sensor concept for the entire load range.